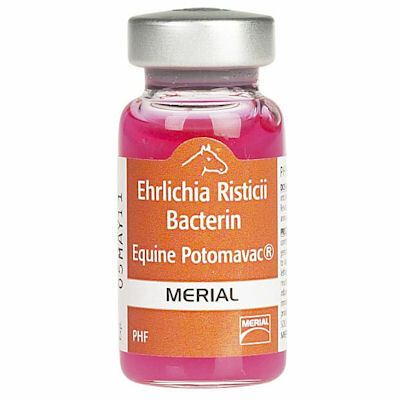 Potomavac (Merial) Killed Virus Ehrlichia Risticii Bacterin. For intramuscular vaccination of healthy horses as an aid in the prevention of Potomac Horse Fever. Potomavac consists of inactivated Ehrlichia risticii organisms. An adjuvant is added to enhance the immune response and to promote the proper rate of vaccine absorption following inoculation. Dosage and administration: Horses, inject one 1 mL dose intramuscularly using aseptic technique. Administer a second 1 mL dose 3 to 4 weeks after the first dose. Revaccinate annually using one 1 mL dose. To insure proper placement of the vaccine, inject deep into the heavy muscles of the hindquarter. Mild daily exercise to promote absorption is recommended for one week after injection.